A. At week 8, the spinal cord extends the entire length of the vertebral canal as spinal nerves exit the intervertebral foramina near their level of origin. 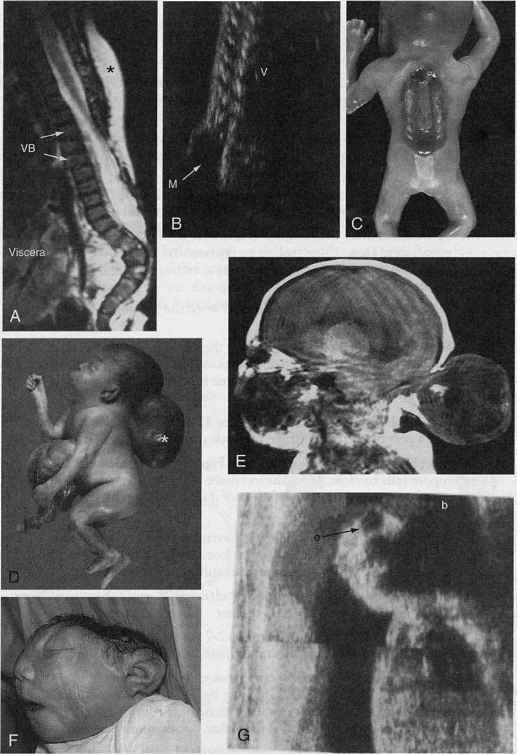 This condition does not persist owing to the disproportionate growth of the vertebral column during the fetal period. B. At birth, the end of the spinal cord (conus medullaris) extends to the L3 vertebral level. 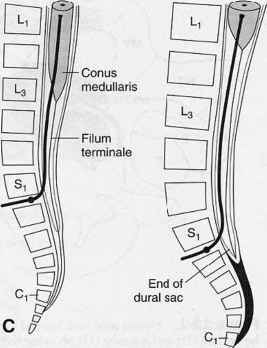 C. In adults, the end of the spinal cord (conus medullaris) extends to the L1-L2 interspace. D. The collection of dorsal and ventral nerve roots that descend below the conus medullaris is called the cauda equina. E. An extension of the pia mater forms the filum terminale, which anchors the spinal cord to the coccyx.